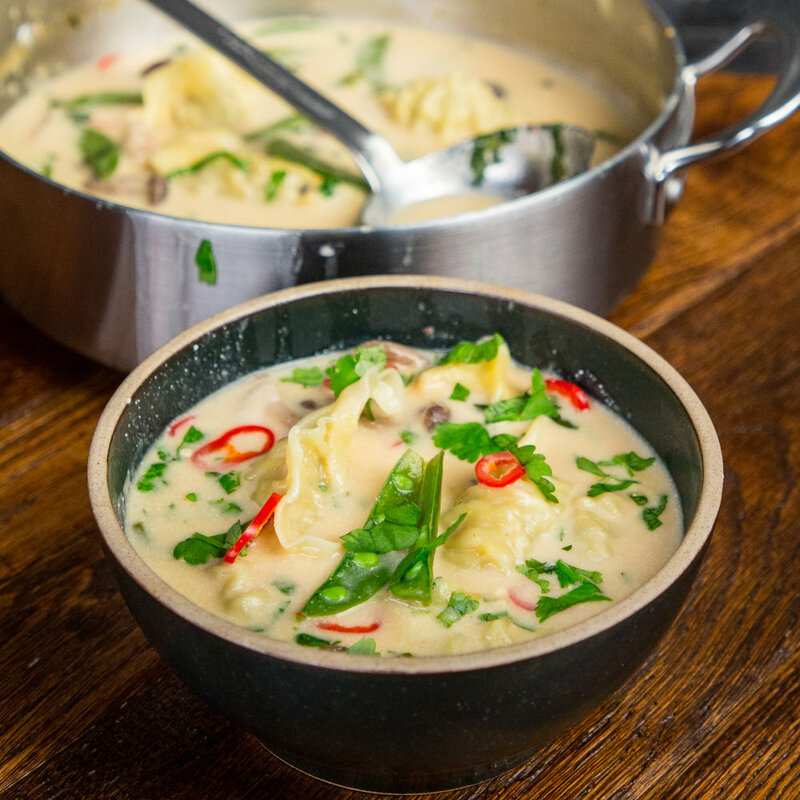 A delicious warming chicken dumpling soup, made with the easiest gyozas ever. Bubble the soup down until it is nice and thick. Grate knob of ginger and 1 red chilli. Add to a pan with a splash of oil. Add your tablespoon of lemongrass. Fry for 30 seconds on a medium heat. Then pour in 2 tins of coconut milk, 3 tablespoons of fish sauce, the juice of a lime and 400ml chicken stock. Mix everything together. Bring to the boil. If the coconut milk is split, just whisk it until smooth. Once boiling, reduce the heat. Add your mushrooms. Cook for 5 minutes, and then add your sugarsnap peas and your Itsu Chicken Gyozas. Mix everything in. After 4 minutes, add a large handful of coriander. Stir it in. Serve the soup in bowls, and scatter chopped chillies and coriander over the top. Get a spoon, dunk it in and enjoy!